TS18: Oh, oh Waterloo, Finally Coming to Train Simulator! Main photograph above, copyright Mike Knell. Just over 6 years ago, we released the popular Portsmouth Direct Line, and today, we are delighted to announce that a extensively re-worked Portsmouth Direct Line is coming soon to Train Simulator, except this time we’re taking the line all the way to London Waterloo! It wasn’t until another branch was opened that things starting looking up, the line out of London passed through the town of Woking, situated just over 5 miles north of the industrious town of Guildford, and a rail connection between the two towns was considered, then granted. The branch to Guildford would form the basis of a more direct connection between London and Portsmouth, with multiple potential lines under discussion by 1845. Eventually, in the early 1850s, a railway between Godalming and Havant was approved, and London could finally reach Portsmouth in a direct manner. However, one key issue still remained, and that was that between the port and Havant, the line was also operated by the LBSCR, who retained territorial exclusivity. The situation worsened significantly with the LBSCR declaring that no Portsmouth Raliway trains could run, and they removed infrastructure at Havant to enforce it. The LSWR fought back by diverting an unscheduled goods train through the opposite line, completely blocking the station. This culminated in the Portsmouth Railway ironically being terminated short at Havant, and a final agreement wouldn’t be met until 1860. The line itself traverses some very rural scenery, and does battle with some rather steep gradients between Woking and Havant, much more manageable with modern traction but without a doubt definite challenge in the steam era, one which was accepted to keep construction costs at a minimum. 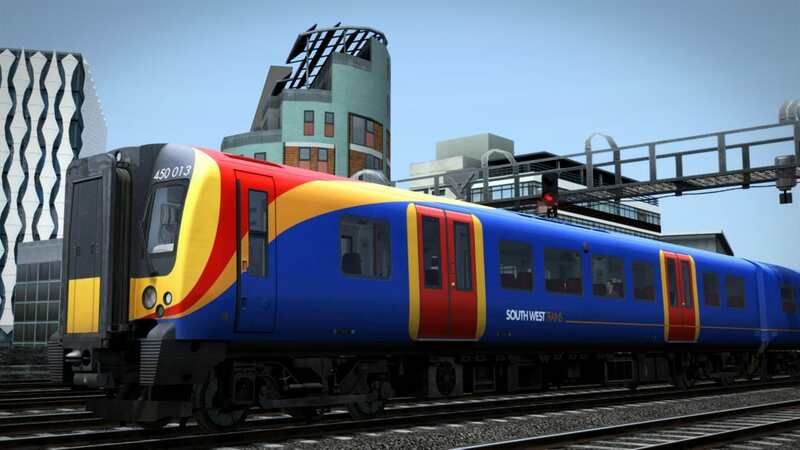 The new Portsmouth Direct Line for Train Simulator will see the current 49-mile route from Portsmouth to Woking extensively re-worked to a modern standard, both in scenery and quality; and in addition, it will be extended a further 20 miles to London Waterloo, with the 1.5-mile branch to Hampton Court included as well. We look forward to bringing you more on the Portsmouth Direct Line: London Waterloo – Portsmouth route in due course, for now however, here’s a first look at your new BR Class 450!